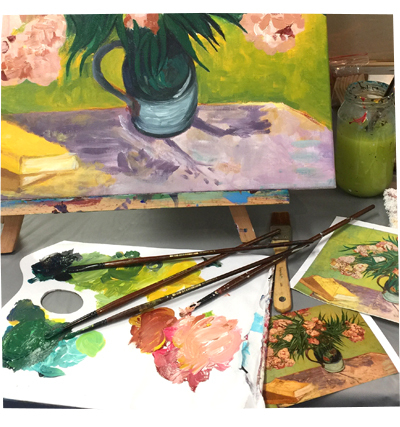 On a bit of a whim, I went to a social art class with my sister! 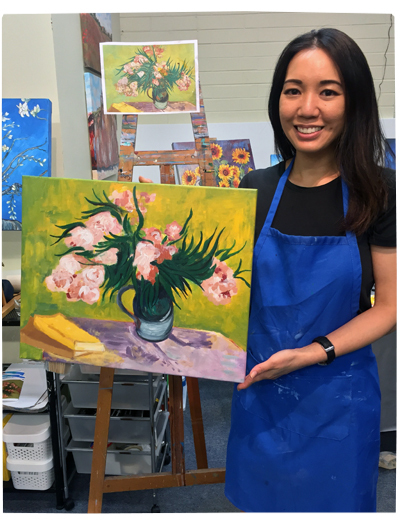 There are a few of these classes happening around Perth, but the one we went to was called, Paint & Sip in Wembley. How it works: Each evening has a “chosen painting”. 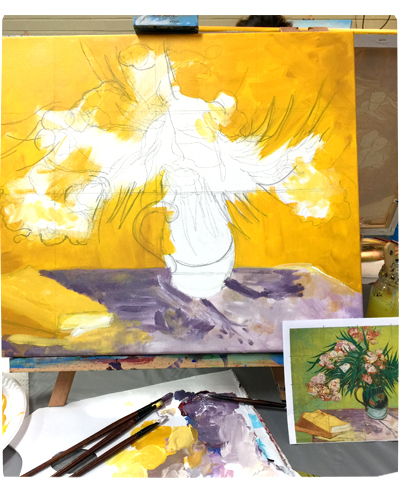 You pay to book, you turn up, have a glass of alcohol, enjoy an array of cheese, fruit, dips, food, and a qualified artist will lead you through, step by step, to paint the chosen painting – with all the paints and equipment provided. It’s a simple and fun idea. It’s not a “proper” art class. It’s supposed to be social, enjoyable and relaxed. You’re not supposed to take it too seriously… and you’re supposed to drink a few glasses of wine! *I have to mention that both my sister and I don’t drink much alcohol… and we BOTH went to an art school (a high school with a specialised art program). We haven’t painted in YEARS and we were itching to pick up some brushes again… soooo we were definitely taking it quite seriously haha! 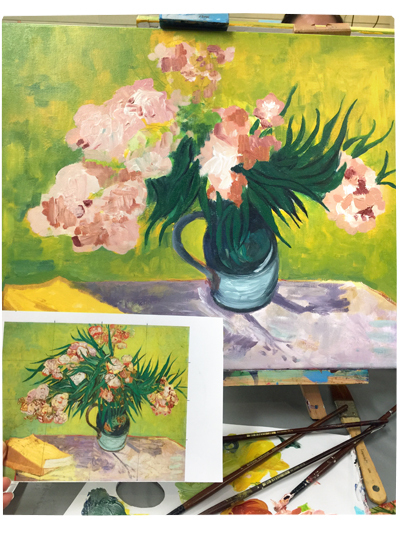 Our chosen painting was “Oleanders” by Van Gogh. I was super keen to do this painting because it’s a lovely, lesser-known painting by Van Gogh. 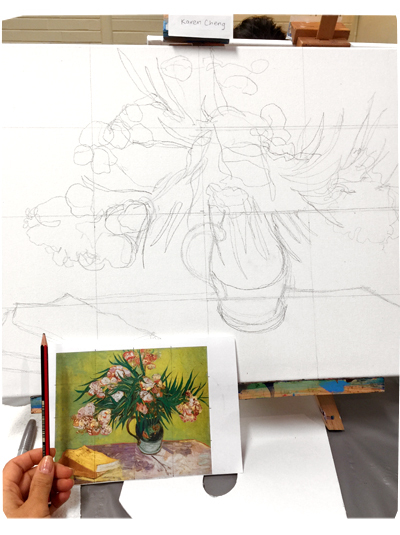 First up: We made a grid on our canvas and sketched out the painting. The lovely artist, Lousie Collier, gave us lots of great advice, including which areas to work on first and which colours to use. She was awesome! The paints were really good quality. So were the brushes. She even provided rags, aprons and rubber gloves. 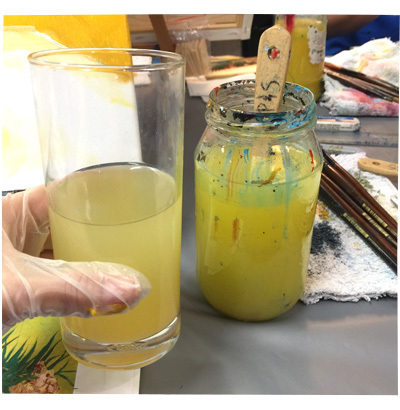 I was drinking pineapple and coconut juice tonight, which looked just like my paint cleaning water haha! Look at my beautiful mess! In terms of painting, I have more experience with oil paints. Oils take HOURS to dry, and you have to paint with them in a certain way. In this session we used acrylic paints, which dry in 5 minutes (!! ), so I found it quite tricky to change my painting style. It was a challenge and I liked it. I also decided that I wanted to copy Van Gogh’s painting, rather than interpret it. This was a new thing for me, as I don’t think I have ever tried to copy someone else’s painting down to the last stroke. When I used to paint, I just went with the flow of ideas in my head at the time. So this was more of an exercise of skill for me… a very fun one! We had to mix our own colours too. Ooooh I loved it. It was so much fun to have so many of my old skills come back. And see how I stacked and criss-crossed my brushes on the palette? I used to do that exact same thing in high school. Even all my bad art habits came back haha. This is my work near the end of the session. Not finished! The session started at 7pm… and by 10pm, everyone else had finished and started to pack up. I worked on it for another 30 minutes, but really, I need another 3 hours. It was 10:30pm and I had to take it home to finish it off… oh well. Louise actually said I could stay as long as I wanted, but I was getting tired and I still had to drive home. So this is my unfinished work. I’m a little meh about it right now. I’ll finish it one day! It was so much fun to paint and such a good night!